It’s the most wonderful time of the year…until it isn’t. With the holiday season in full swing, your schedule, credit card bill, and jeans might all be on the verge of busting at the seams thanks to holiday parties, shopping, and treats at every turn. 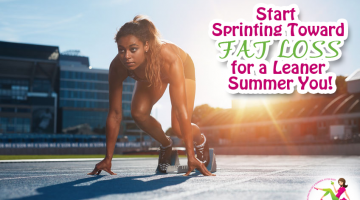 December is quite often the time when a lack of willpower and time means making good eating choices and working out consistently fall to the wayside. 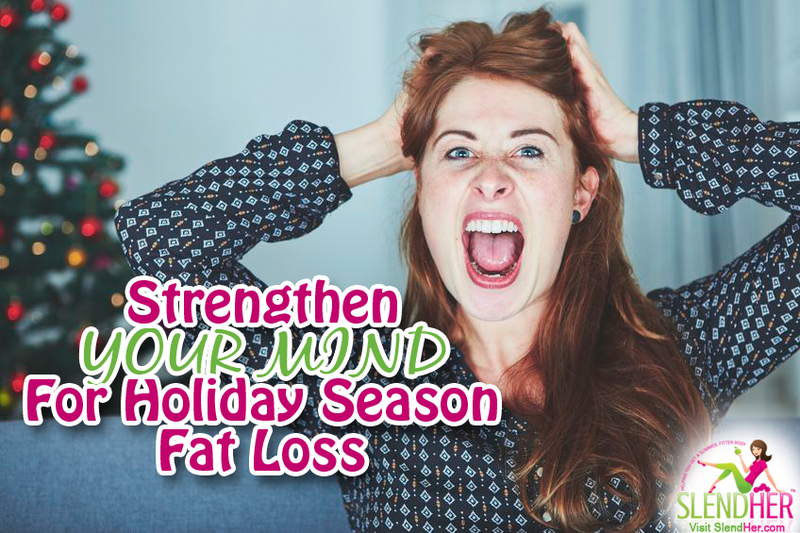 But possibly the biggest culprit knocking you off your fat-loss track is holiday season stress. For many it’s the season to be merry, but don’t get down on yourself if it feels more the season to be overwhelmed. The halls are often decked with a list of demands rivaling the length of Santa’s naughty or nice list. Thanks to entertaining, cleaning, cooking, gift giving, present wrapping, decorating, and so on, the holidays are hectic. And when life gets busy, the first thing to drop from the priority list most often is you. For the sake of holiday season sanity, something has to give–but it doesn’t have to be your goals! Your health and well being are worth more than setting the perfect table, scoring the perfect present, or baking the perfect cookie. (Hint: Perfect doesn’t exist.) And while you may know you’re worth more, the stress of the holiday season can create obstacles to treat yourself as such. Use the following tips to get your mind right so that you can keep your holiday season fat loss goals on track. Be the change. Just as you grow and evolve with time, so should your holiday season traditions. Don’t aim to make your holiday season just like last year or as you remember the holidays as a child. Pick two or more traditions and rituals that bring you joy, and let the rest of them go. Ask for help. You are surrounded by friends and family who love you and want the best for you. You are not letting anyone down by asking them to bring a dish to pass at the holiday table instead of making all the food yourself. You are also not letting anyone down if you only put out half of your holiday decorations (again, the ones that are the most meaningful to you) or request gift exchanges be skipped for the adults. Requesting help can create less to do, and more periods of calm. Just say no. The 80s’ war-on-drugs campaign slogan can (and should!) be applied to the holiday season. If you’re already feeling strapped for time, money, or both, say “no” to party invitations, cookie swaps, secret Santa gift exchanges, and anything else that feels more stressful in which to participate. Plan ahead. Avoid the stressful last-minute rush for gifts, recipe ingredients, and other holiday season odds and ends. Lists will be your friend here. Take a tip from the big guy himself: Check your list twice before heading out to the stores–or better yet, order as much as you can online to avoid crowds and impulse purchases. Meditate: Even a short, 10-minute meditation practice a day can help you to reduce stress, up your happiness, and improve your overall health. And while you can certainly sit and “om” for a period of time each day, mindfulness meditation allows you to keep on your tasks while meditating at the same time. It’s about awareness and being present. So instead of letting your mind wander while your wrap gifts, bring your senses in on the activity to notice the sights, smells, sounds, and feel. That combined with slow, controlled breathing can create a bliss-like state you may never thought possible during the holiday season. Rest. There are only so many hours in the day to get everything done. Don’t be tempted to lengthen that busy time by skipping on sleep. Not getting your Zzzs at night can throw you off schedule more so than any other holiday demand. Instead of crossing off your to-do list like a boss, sleep deprivation can slow you down and cause you to make mistakes (which means repeating tasks more than once). Head to bed instead and wake up ready to take on whatever the holiday season may toss your way. Reward yourself. With each holiday season task you complete, reward yourself for a job well done. While your first thought may be to treat yourself to one of the many holiday season goodies available, choose something better for your body instead. Mani/pedis, massages, a decadent daytime nap, a coffee break, or a snowy walk in the park are options that will both reward and restore without any regret. How do you keep holiday season stress in check? Share with others in the comments!